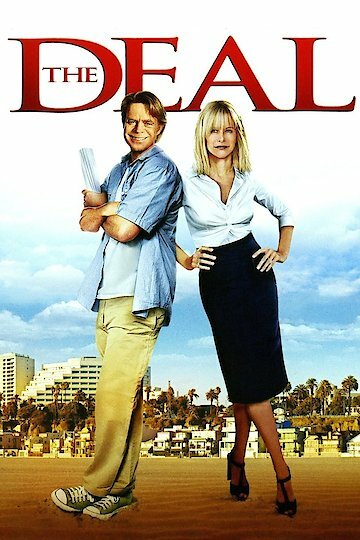 "The Deal" is a movie based on a 1991 novel about a film producer who agrees to make his nephew's movie about a 19th century English statesman. The producer can only get funding if he casts a big action star in the lead role. However, the lead actor is kidnapped and the producer must rescue him in order to save the movie. The film stars William H. Macy (Charlie Berns), Meg Ryan (Deidre Hearn), LL Cool J (Bobby Mason), Elliot Gould (Rabbi Seth Gutterman), Jason Ritter (Lionel Travitz) and Fiona Glascott (Fiona Hicks). The film was written by William H. Macy and Steven Schachter, who also directs it. The 1991 novel of the same name was written by Peter Lefcourt. Muse Entertainment Enterprises produced the film and Peace Arch Entertainment distributed the film. The film runs 100 minutes long and was first released in 2008 at the Sundance Film Festival. The Deal is currently available to watch free on Tubi TV, Vudu Free and stream, download, buy on demand at Amazon online.